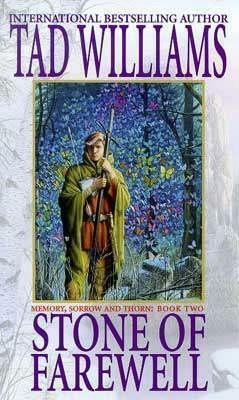 The online guide to "Memory, Sorrow and Thorn", "The Heart of What Was Lost", and "The Last King of Osten Ard"
t is almost a joke, certainly a cliche, that any large-scale multi-volume fantasy novel will be described on its dust jacket as being ‘in the tradition of Tolkien at his best’, regardless of its actual merits or the degree to which, if at all, it has been influenced by Tolkien. Such descriptions are an attempt to shill readers into purchasing books; they also, both for good and ill, reflect the immense influence Tolkien has had on his readers and especially perhaps on those of his readers who subsequently become writers. There is inevitably a close relationship between the desire of publishing houses to have new saleable product in their lists, the desire of many readers to buy something which at least superficially adheres to a much-loved formula and the ambition of writers to produce books which resemble those of a writer they admire. It should not be assumed that this relationship is entirely corrupt; life and literature are more complicated than that. De Camp reprinted in these books stories by both Robert E.Howard and Fritz Leiber; Low High Fantasy story cycles such as Howard’s Conan stories, many of them completed by deCamp and his associates, and Leiber’s Fafhrd and the Gray Mouser tales were reissued in paperback in the course of the late 1960s. (Leiber was encouraged by this to write more stories in the cycle, which reflected the preoccupations of his late phase with disillusion and recovery.) De Camp’s own original work in comic portal fantasy, including his collaborations with Fletcher Pratt, continued to be reissued during the Sixties and Seventies and were an influence on such minor writers as Marvin Kaye.It is important to remember that Howard, deCamp and Leiber were of a generation that were formed by the same influences – Dunsany, Eddison – as Tolkien himself; Howard died before Tolkien had published a word of fiction and Leiber and others read him as adults. One of the most interesting fantasies of the early 50s is Poul Anderson’s ‘The Broken Sword’ (1954) in that it draws on the Scandinavian material that was one of Tolkien’s influences, but does so with a bleakness entirely alien to Tolkien. Though the universe Anderson shows us is one in which good has a role, possibly a primary role, there is never quite the sense that all will, in the end, be well that pervades LOTR in spite of its effective portrayal of the possibility of universal jeopardy. The young Anderson had a tragic view of life – even a conservative like Anderson who found a measure of social hierarchy congenial was not necessarily sold on the essential optimism that, in Tolkien, goes with that sense of the restoration of order. Those writers in the next generation who specifically rejected the theodicy of Tolkien’s trilogy on ideological grounds were inevitably drawn to imitate Howard and Leiber in much of their actual work, even if the models they professed to draw on were more literary. Michael Moorcock was derisory in his attacks on Tolkien referring to LOTR as ‘Epic Pooh’ and claimed as his master the Mervyn Peake of the Gormenghast books (a trilogy only in the sense that Peake was only healthy long enough to write three of them). The various versions of the Eternal Champion which Moorcock wrote about from the early 60s onwards were posher and more sensitive than Conan, less likely to wander into farce plots than Fafhrd and the Gray Mouser, but they recognizably inhabited the same moral universe even when compelled to save the world. Moorcock’s dislike of Tolkien’s Christianity resulted in his choosing to make his protagonists defenders of the Balance between Order and Chaos rather than, ultimately, partisans of either side. Moorcock and such associates as M. John Harrison actually wrote material influenced by the pulp Low High Fantasists, but their aspiration was higher than that. The model they professed to admire was Mervyn Peake, the visual precision of whose prose derived in part from his artist’s eye for detail. At the same time, it can hardly be said that Peake influenced their plotting save through pessimism – Harrison’s ‘The Pastel City’ and ‘A Storm of Wings’ remain firmly in the Low High Fantasy tradition, and even the later, more genre-crossing additions to the Viriconium cycle retain some links to pulp stories of warriors and maguses, even when they are mostly concerned with doomed Decadent artists. Harrison has in turn inspired younger writers like China Mieville, whose rejection of Tolkien on political grounds is far more considered and intellectual, far less instinctual. In all of these writers, rejection of Tolkien is a rejection even of an antagonistic relationship with him, a collective view that his influence had been altogether bad. One of the other strains of fantasy which grew up in the late 60s was revisionist about gender and to a lesser extent race, but was far more involved with Tolkien and his legacy. Ursula LeGuin’s Earthsea Trilogy (1968-72) was published in the first instance, like the reissues of Leiber, by Ace Books, who had been responsible for the unauthorised publication of LOTR. This trilogy, subsequently expanded and auto-critiqued by later volumes such as ‘Tehanu’ (1990) made a point of having its ‘good’ culture be brown-skinned and its unpleasant theocracy blond, taking quiet note of the tendency of other High Fantasies to be inhabited by the white-skinned. LeGuin’s later criticism of herself and her readers in ‘Tehanu’ for not being anti-sexist enough should not obscure the fact that even the male-centred ‘A Wizard of Earthsea’ refused much of fantasy’s standard ideological baggage about masculinity and its discontents – Ged is not merely a man who goes on learning, but one who is uneasily aware that there will never be any end to his need to learn more. LeGuin’s relationship with Tolkien is complex and uneasy; she is aware of his influence on her, critical of much of his ideological baggage and totally aware that killing the father, or walking away from him totally, is something boys do, and she need not. At the same time, she found his emphasis on the theme of return highly congenial, and some of her quasi-Taoist thinking about the appropriate use of magic derives from the differentiation made by Tolkien between the showy magical effects of his evil mages and the minimalist use of it in dire necessity by Gandalf, even after his transfiguration. She also welcomed Tolkien’s decision to centre his narrative on the unconventional heroism of Bilbo, Frodo and Sam, whose virtues are those of endurance and nurture, and whose courage is more moral than physical. Tolkien was a very long way from being a feminist and yet there were emphases in his work that a feminist like LeGuin could make use of. Both LeGuin and Tolkien are theoreticians of story. Again, Tolkien’s metaphor of the stewpot into which elements are eclectically thrown was one clearly congenial to LeGuin, whose own preferred metaphor of the shopping bag into which the female gatherer puts what comes to hand without necessarily organizing it into something as phallocentric as a plot, with an ending, is to some degree an echo of it. Much of LeGuin’s highly considered and thoughtful relationship with Tolkien takes the form of a strategy of revisionism or refusal. Where Tolkien’s plots are set in motion by individual criminality, albeit on the vastest of scales, LeGuin’s have to do with the consequences of what is false within, or the tyranny of institutions like the Karhidish religion in which no one single person is specifically guilty of more than petty oppression. Where Tolkien’s dragon Smaug is, while personable enough, a traditionalist one with a hoard and a taste for sarcasm and riddles, LeGuin’s dragons are far more complexly Other, beings whose whole point is that communication with them is possible, but empathy harder. When, in later books, the relationship between humanity and dragons is shown metaphorically to reflect the complexities of that between men and women, it is a happy piece of retconning that never feels like a cheat. Rather later on, there grew up a strain of high fantasy which was explicitly feminist and therefore almost as entirely uninterested in having a critical relationship with Tolkien as the Moorcock group and its epigones. Marion Zimmer Bradley’s ‘The Mists of Avalon’ (1982) is an Arthuriad centred on the perception that Guenevere is a priestess of the Old Religion, a Celtic paganism back-projected from the works of Gerald Gardiner and Margaret Murray rather than closely related to what we know of the actual history of Celtic religion, which seems to have been in most respects quite as patriarchal as its successful rivals. Many of Bradley’s heirs and imitators avoid such issues by placing their pariah elites of witches, telepaths and elves in fantasy worlds untrammeled by the inconvenience of historical fact. Much of what has been published as fantasy commercially derives at least as much from the Howard and Leiber tradition, or from Moorcock, LeGuin and Bradley as it does from Tolkien, even when its rogues are caught up in plots which oblige them to save the world. Mid-list fantasy is eclectic in its sources – one has only to look at writers like Martha Wells and Barbara Hambly to see all of these influences in full flower, and the same applies to better-selling writers like Robin Hobb (Megan Lindholm) and George RR Martin, who have demonstrated that it is possible to write large scale best selling novels of heroic fantasy whose debt to Tolkien is peripheral at best. However, most of the best-selling fantasies of the decades since Brooks have nonetheless been written in a mode that clearly derives from imitation of Tolkien and from a relationship with him which is one of endebtedness rather than primarily antagonism and it is this strain which we will now consider – such texts as Brooks’ Shannara books, David Eddings ‘The Belgariad’, Stephen Donaldson’s ‘Chronicles of Thomas Covenant the Unbeliever’, Terry Goodkind’s ‘The Sword of Truth’, Robert Jordan’s ‘The Wheel of Time’ and Tad Williams’ ‘Memory, Sorrow and Thorn’. The post-Tolkien fantasy can be recognized partly through its scale – LOTR’s three volumes have usually been exceeded both numerically and in terms of the size of individual volumes – and partly through the imitative use of recognizable tropes. As a general rule, and with variations that may take the form of deliberate refusal of the tropes, a Dark Lord who has attempted to take power on earlier occasions, often in the distant past, and been defeated, is returning to potency with the assistance of creatures he has warped and other allies. A group of the powerless is assembled, often under the tutelage of the wise, and they travel the threatened Land, gathering both the wisdom and the talismanic objects which are needed to defeat Evil. Martial valour is important to this victory, but so is a capacity for fine discrimination, and perhaps compassion. At story’s end, to some degree, earlier falls from grace are partly compensated for, but at some terrible price. Some of what is taken from Tolkien is what John Clute and I, in the Encyclopaedia of Fantasy, termed maggots – half-baked and offensive unexamined ideas about the importance of virginity, the role of women and the innate evil of certain groups that derive eclectically from religion, Victorian pseudo-science and Orientalism. Some of it is more interesting, if equally unexamined – an assumption, for example, that evil is less capable of understanding the motives of the good than vice versa, and a belief that Providence works through paradox. Another often-copied Tolkien mannerism is the interpolation of songs – where Tolkien was at least a minor poet of the Georgian school, few of his imitators are that competent. Interpolated stories are one of the ways in which Tolkien gives his readers a sense of the deep abyss of time which provides his narrative with roots. We know far better now how much LOTR was merely one of a number of narratives which Tolkien had fleshed out in his mind on paper and the extent to which the interpolations and appendices are allusions to these other works. What this background does in the specific contex of LOTR is to provide the trilogy with a thickness of epic texture which has always been one of its major appeals – each reference slingshots the reader into a sense of the vastness of Tolkien’s project. Most of Tolkien’s imitators have at least attempted something of the sort, but without decades of rumination on their secondary world’s back story – accordingly, the texture is liable to be significantly thinner. The chunks of mythology with which David Eddings starts each volume of the ‘Belgariad’ are a good example of this limitation, as is the comparative slightness of his portrayal both there and in appended volumes like ‘Belgarath the Sorcerer’ of the burden of an immortality that causes his mages to outlive everyone they care about. An aspect of Tolkien which inspired his new readership of the 1960s was his distrust of technology and its effects. Pollution and environmental degradation are seen almost always in post-Tolkien fantasy as examples of debasement and desecration, as the outward signs of inner corruption. Mordor and the lands on its borders are a transmogrification of the industrial landscapes of Tolkien’s childhood after he moved to the Midlands from South Africa as well as the churned mud of the First World War’s trenches – one of his strengths as opposed to his imitators is that these were direct elements in his lived experience. Donaldson manages an effective portrayal of debasement by having evil inflict plagues and corruption on the Land somewhat in the manner of Jehovah. Williams restricts his portrayal of industrial debasement to the climactic scenes in which Simon undergoes ordeals by fire and water in Pryrates’ underground foundry; in scenes with malign giants, creeping squidlets and ravenous burrowers he derives from Tolkien’s other perception of evil, that it represents a return of repressed elements never properly dealt with. The first of the major imitators, Terry Brooks became, with the publication of ‘The Sword of Shannara’ in 1977, and has remained, a highly successful author for as long as he has stayed at least notionally with the Shannara brand name, though later volumes have derived far less obviously from Tolkien. (His other lighter books – ‘Magic Kingdom for Sale’ for example, have generally been rather less commercially successful. For one thing, the main line of ‘The Sword of Shannara’s plot uses up much of the cure for the world’s pain, destruction of the Dark Lord, and metamorphosis of an ugly duckling hero to full heroic status that are part of the template for post-Tolkien fantasy. For another, where the world of LOTR is one that has fallen away from close communication with the deity and with the natural world, the world of the Shannara books is one which has changed to a world of magic from one in which there was once advanced technology. Several of the later books deal in part with left-over pieces of such technology -‘Antrax’ (2001) has as a subsidiary villain a vast autonomous and self-aware computer. Generally speaking, Brooks is at his most interesting when his books derive least from Tolkien, while remaining within a world created originally in imitation of him. What the success of ‘The Sword of Shannara’ ensured was that one of the main strains of fantasy publishing would become and remain material which derived much of its material at second hand from Tolkien. It would be a literature of comfort in which the ability of the reader to expect what a book or more probably a series of books would deliver would be at least as important as originality. Furthermore, where Tolkien was creating Middleearth and its inhabitants out of his long fascination with dead and created languages, and with literature that demonstrated the potential of those languages for expression of thematic material he found congenial, and for sheer linguistic complexity, many of his imitators were mostly concerned with Tolkien and the more superficial of his techniques and themes. Many of them have a tendency to verbal infelicity which indicates a failure to pay attention to Tolkien’s good ear for such things as names – Robert Jordan’s footsoldiers of evil, for example, are called Trollocks. To take but one example of much copied elements of LOTR, Norman Cantor in his ‘Imagining the Middle Ages’ (Morrow 1991) rightly points to the extent to which Tolkien’s portrayal of the arduousness and duration of long journeys on foot and horseback has altered popular perception of the lived experience of pre-technological epochs. Tolkien disdained allegory, but his perception of the hardships of travel was inevitably informed by his Catholic sense of all mortification of the flesh as something which can be used as spiritual discipline. Hardship flenses Frodo of much of his earlier bourgeois taste for comfort and is part of what enables him to resist the temptation of the ring for as long as he does. In many of the imitative epics which derive from Tolkien, journeying is a plot device with little in the way of moral content. It is a mechanism for wandering among peoples who represent aspects of the moral universe far more schematically than Tolkiens ever did, for collecting plot tokens (Nick Lowe’s useful term for the talismanic items often crucial to fantasy plots) and for collecting travelling companions. In David Eddings, in particular, it largely lacks emotional content – Tolkien was formed by his experiences in the trenches of the First World War and all of his journeys into war and peril have to some degree that sense of the journey up the line to death. Where that sense of potential doom is lacking, as it is in Eddings’ ‘Belgariad’ sequence, it is not enough to be travelling through difficult terrain. Tad Williams’ Simon and Miriamele, in ‘Memory, Sorrow and Thorn’ undergo journeyings that are a part of the moral education that will fit them for rule – it is important that both nearly die on journeys, he from starvation and exposure, she from storms at sea. The jeopardy is real and evocatively felt; it is also there for a purpose other than the requirements of the Tolkien template since the hardship and jeopardy that Simon and Miriamele undergo are there to equip them for monarchic rule. Where Frodo’s hardship fits him for his mission, the mission Simon believes himself to be on is a colossal mistake; what saves the world is his capacity for compassion, a capacity that was present in him from the start. In Stephen Donaldson’s ‘Chronicles of Thomas Covenant, the Unbeliever’, Ballantine’s other great fantasy investment of 1977, the journey is as much fever dream as steady plodding. Donaldson’s debt and relationship to Tolkien is sufficiently marginal in most respects that he almost fails to belong in the group of Tolkien’s heirs; what he does derive from Tolkien, while putting his own spin on it, is a sense of journeying as moral experience. In his case, there is the complication that Thomas, as a leper, dare not allow himself too much sense of the reality of the landscape through which he passes because he is compelled by the necessity of his condition to a brutal realism threatened by the possibility that he has wandered through a portal into some other realm. Hallucination is less of a threat to his moral universe than magic – journeying potentially regrounds him in the Land, whereas he needs to be grounded in his constant need to inspect his extremities for further signs of decay. In the end, of course, Thomas finds his way to a balanced perception that allows him to perceive the Land as real enough to involve him in moral responsibility for the welfare of it and its inhabitants, while maintaining his distance from full commitment to its epistemological status. Donaldson demonstrated that it is possible for the multi-decker fantasy novel to be a work of moral earnestness at a point where Brooks and Eddings were watering down Tolkien into a set of plot gestures and decorative descriptions, and ignoring part of the point of what epic is for. Unfortunately, this seriousness on Donaldson’s part has been to some extent vitiated by his inability to leave the material alone – in 2004 he embarked on a third Thomas Covenant trilogy in spite of Thomas’ death in the sixth volume – and by a style whose over-reliance on unusual vocabulary and set phrases many readers find alienating. The other serious weakness of Donaldson’s work is one he shares with other High Fantasists such as Brooks, Robert Jordan and Terry Goodkind. One of the strengths of LOTR is Tolkien’s creation of a cast of characters about all of whom we genuinely care – the emphasis placed by the title of the first volume ‘The Fellowship of the Ring’ indicates that this is, among other things, a novel about comradeship in which the efforts of a large cast of characters are essential to the quest’s success. It is possible to engage passionately with Thomas Covenant and his fate, but few readers feel as strongly about, say, the giant companion whose laughter in the face of defeat makes it possible for Thomas to defeat his adversary Lord Foul as they do about even a comparatively peripheral figure like Tolkien’s Legolas. Eddings’ admirers often argue that he is an exception among his peers and point to characters like the princely thief Silk as examples of endearing characters; in this case, and arguably even with the dangerous virtuous wizard and sorceress Belgarath and Polgara, asserts these characters’ lovableness so often that he wears the readers down. It is better to show than to tell, but sometimes telling often enough is reasonably effective. The same is true of the characters met in chance encounters. Tolkien’s elf-lords and monsters are memorable; most of those of his imitators not. 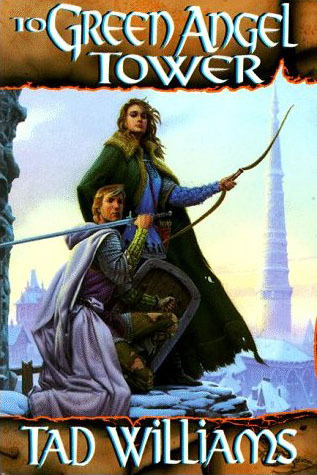 A partial exception can be made here for Jordan, in that his chance encounters are often with people or creatures whose status is at least intellectually interesting; Jordan’s interminable ‘Wheel of Time’ sequence is at its most interesting in side-bars to the conventional post-Tolkien plot where he creates, for example, a warrior people the motivating force of whose frenzied bravery is guilt at having abandoned their original pacifism. There is a naive creativity to Jordan, a capacity for wondering ‘what if’ about the cliches of fantasy which sometimes leads him into odd tangents like the obsession of his conspirator nuns with corporal punishment, and sometimes creates genuinely interesting plot strands like the need to find a way of operating magically around the contamination of all male magic. Unfortunately, this is the positive side of a tendency to proliferate which means that the sequence has extended to so many volumes – each of Rand’s original companions has acquired some sort of kingdom with the affairs of which we have to be so continually updated that the sequence’s central topic – the battle against a Malign Sleeper Dark Lord and his various accomplices – has slowed down to a snail’s pace. Terry Goodkind’s sidebar characters and plots are interesting primarily in terms of the way they fit into his overarching cynicism. We discover in ‘Wizard’s First Rule’ that ‘ People are stupid’ and the various death cults and groups of the magically empowered that we encounter subsequently do nothing to change this perception. The utter ruthlessness of both good and bad characters makes for a depressing read – Goodkind starts cynical and becomes bleak. The weakness of the Sword of Truth sequence lies in just this – that its hero and heroine are only likable by comparison with the utterly murderous. What Goodkind does bring to the post-Tolkien epic is a sense of evil that is genuinely disturbing, deriving from 20th Century monsters like Hitler and Jim Jones. His use of sado-masochistic imagery is altogether more interesting than Jordan’s slightly fetishistic use of spanking – there is a real sense of the perverse in Goodkind. One of the weaknesses of his rivals is in this area. Eddings, for example, has Torak, a Cain-like fallen deity hideously marked by the presumption which damaged the world. Torak’s minions are a cabal of evil mages, continually trying to outdo each other. All of which would be impressive enough were the felt experience of evil in the ‘Belgariad’ even as intense as that in Jordan, whose evil enchanters sometimes have glamour to make them interesting, but the final encounter is as slight and bland as anything else in Eddings, whose charm and weakness is his fondness for pastel-coloured prose. One of the many strengths of Williams ‘Memory, Sorrow and Thorn’ has to do with his refusal to deal in the moral absolutes of Tolkien. For one thing, Williams deals far more convincingly than Tolkien with redemption – where it is necessary for the salvation of the world that Gollum finally fall to his damnation, the brutal warrior Guthwulf is changed forever by the consequences of a single unselfish act. He intervenes to save the housekeeper Rachel from murder by the evil magician Pryrates and is blinded for his pains, and left wandering in the cellarage of the Hayholt, the edifice which dominates Williams’ trilogy. In a particularly telling moment, starving, he decides not to kill a cat and we realize that he has changed. He helps Simon escape from the vast waterwheel to which the youth has been bound and dies of his efforts. Williams’ world is one in which it is possible for the evil to change. Williams’ refusal of moral absolutes extends to his take on the figure of the Dark Lord; the principal adversary in ‘Memory, Sorrow and Thorn’, the Storm Lord Ineluki, is a being who has suffered great wrongs, though his principal ally, the Norn Queen, is more concerned with the effects of great age and stored up grudges of a trivial, almost domestic kind. What Ineluki wants is not to have died, and he is prepared to destroy time and everything bound by it to return to the world – what he wants is something even more unjust than the human-on-elf genocide of which his death was part. This selfishness is what he shares with his pawns – Pryrates wants knowledge at the expense of all other value and the corrupted King Elias wants his wife not to have died. What enables Simon and Miriamele to defeat them is in part a moral education which enables them to get past their own innate capacities for selfishness. Miriamele would like nothing better than to have her mad debased father restored to her as he once was – but the most merciful thing she can do for him is to kill him once Ineluki has possessed him body and soul. Simon would like back his carefree life as a kitchen-boy and scholar’s apprentice – but he returns to the Hayholt as its lord; he would like back the simple affection he and Miriamele shared before he knew she was a princess – instead, they have a marriage based on acceptance of each other’s sexual history with others and on the fact that, even if they did not in fact love each other, their marriage would be a necessity of state. Another reason is that, far more than the other post-Tolkien narratives, ‘Memory, Sorrow and Thorn’ shows the footprints of other influences. In the first volume ‘The Dragonbone Chair’ in particular, Simon derives from T.H.White’s Wart as much as from Frodo; without realizing it, he undergoes the education of a future king, and gets it as much from the housekeeper Rachel (who gets the last word of the body of the trilogy) as from his Merlin, Doctor Morgenes. His self-education by clambering around the tunnels and roofs of the Hayholt, eavesdropping on secrets and catching sight of distant princesses, is reminiscent of the early phase of the career of Steerpike in Mervyn Peake’s ‘Gormenghast’ books, before that other young man on the make turns to evil. The Hayholt itself unites the influence of Tolkien with that of Peake – it is at once a gloriously complicated edifice, a haunted palace of the mind, and a repository of centuries of secrets, and repressed bad faith; it is a worthy successor of elements in both writers, because Williams learned, in this first of his major works, that the importance of an influence is to use it, and be transformed by it, not to be imprisoned by it. OstenArd.com is humbly thanking the author for allowing us to publish this wonderful piece. I am deep, deep, DEEP in Osten Ard history at the moment. Having finished the first drafts of both THE WITCHWOOD CROWN and THE HEART OF WHAT WAS LOST — in the first case, most of a year ago — I’m in rewrite mode on both to finalize the stuff I left vague in the first drafts. Williams began writing The Witchwood Crown in 2014, and had finished the rough draft back in May 2015. The first draft of The Heart of What Was Lost was completed in November 2015. I know so much more about my own imaginary environment than I did a year ago, despite the fact that I think it was already one of the more catalogued invented worlds. I know the name of all the original Scrollbearers (the learned folks who make up the League of the Scroll) when King Ealhstan began it, two hundred years or so before Simon and company. I know the history of the two great families of immortals, the Hamakha and Sa’onserei, all the way back to the garden, in far more detail than anyone else needs to know. I know the order in which the Eight Ships came to Osten Ard, and I know what happened to Seni Ohjisá, mentioned only in a song in the first set of books. I know the names of people’s horses when even the names of the people who ride those horses will remain essentially meaningless trivium in the final story, if they even show up. Williams’ mention of the families Sa’onserei and Hamakha refers to the ruling dynasties of the Sithi and the Norns, two of the immortal (and ever-feuding) races in the classic Osten Ard novels, with Queen Amerasu no’e-Sa’onserei presiding over the mortal-hating Sithi, and Queen Utuk’ku seyt-Hamakha ruling over the even-more-mortal-hating Norns.The two families’ bitter, centuries-long feud is a central plotline in Memory, Sorrow and Thorn, and lies at the heart of the conflict in the series. They crossed a bridge over one of the river-forks, then turned and followed the watercourse down a long corridor of willows. A ribbon of white cloth wound in and out among the trees on their left, wrapped about trunks and looped over branches. As they passed farther down the row of willow sentries, the initial ribbon was joined by another. These two snaked in and out, crossing behind and before each other as though engaged in a kind of static dance. Soon more white ribbons of different widths began to appear, woven into the growing pattern in knots of fantastic intricacy. These weavings at first made up only simple forms, but soon Simon and Aditu began to pass increasingly complex pictures that hung in the spaces framed by the willow trunks: blazing suns, cloudy skies overhanging oceans covered with jagged waves, leaping animals, figures in flowing robes or filigreed armor, all formed by interlaced knots. As the first plain pictures became entire tapestries of tangled light and shadow, Simon understood that he watched an unfolding story. The ever-growing tapestry of knotted fabric portrayed people who loved and fought in a gardenlike land of incredible strangeness, a place where plants and creatures thrived whose forms seemed obscure even though precisely rendered by the unknown weaver’s masterful, magical hands. “Here,” Aditu said, startling him. The tapestry had led them to a whirlpool swirl of pale fabric, an inward-leading spiral that appeared to lead up a gentle hill. On the right, beside this odd door, the tapestry leaped away across the river, trembling in the bright air like a bridge of silk. Where the taut ribbons of the tapestry vaulted the splashing stream, the knots portrayed eight magnificent ships at sea, cresting woven waves. The tapestry touched the willows on the far side and turned, winding back up the watercourse in the direction from which Simon and Aditu had come, stretching away from tree to tree until it could no longer be seen. And I’ve also been getting the first feedback from readers of the new manuscripts in the last half-year, so I’m trying to let that wash over me as well, influencing the rewrites in a good way without overwhelming my own natural trust in what I’m doing. That last part is particularly important, because I chose to let my first readers see a much rougher first draft (at least of TWC) than usual, so of course everyone pointed out the stuff that I would most liked to have fixed first before releasing, like “So-and-so has no personality”. I mean, it’s true — So-and-so is definitely a stiff at this point, but part of that is because when I was writing it I wasn’t exactly sure how old So-and-so was, or what he or she had experienced in life, or what was going to happen to him or her later on, and which of the character’s traits and what part of his or her life history would be useful and necessary to deepen the character, and so on. The balance point here, as in any worldbuilding, is knowing how much material you need to know to feel comfortable writing in that world — which will always be less than you’ll actually use. Even though my worlds are generally long on history and convoluted recitations thereof, I obviously won’t cram everything I’ve figured out into the books themselves (although I am getting more resigned to having to do an Osten Ard Companion someday, with Silmarillion-like tellings of all this background material. A good project for my old age, shortly before all the dog hair I breathe and cat scratches I suffer from every day finally kill me). 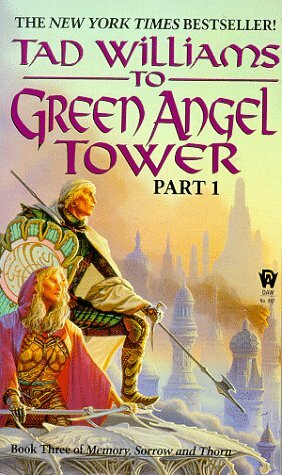 If such a project takes place, the Osten Ard Companion would become the tenth or eleventh Osten Ard book, after The Burning Man, The Dragonbone Chair, Stone of Farewell, To Green Angel Tower (parts one and two), The Heart of What Was Lost, The Witchwood Crown, Empire of Grass, The Navigator’s Children, and The Shadow of Things to Come, the last three of which are expected sometime after the publication of The Witchwood Crown. Williams’ original newsletter posting can be found here. 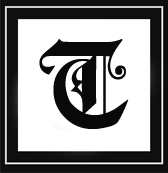 You can subscribe to the newsletter at this link. Readers can speculate on who “so-and-so” is, and of what import the eight Gardenborn ships might play in the new series, and what role long-dead King Eahlstan has to play, on the Tad Williams Message Board, where there are already speculation threads for The Heart of What Was Lost and The Witchwood Crown. Doug Croft (@WayOfTheSword) created a video review of Tad Williams’ “Memory, Sorrow and Thorn” series on the Geekiest of Geeks YouTube channel. He also mentions the new series, “The Last King of Osten Ard”, but fails to mention the new standalone Osten Ard novel, Heart of Regret. His otherwise excellent video review of the books is below. It contains some mild spoilers for the series. Why Are Female Fantasy Authors Pushed To The Back Of The Bus? This blog posting by Leona Henry, on female authors in Fantasy literature, is definitely worth reading. where I learned some rather disturbing facts about the publishing industry. The person who opened the thread was wondering why women prefer writing teen romance centered Urban Fantasy and YA Fantasy and why there are too few female epic fantasy authors. Tad Williams recently posted a partial character list for his new novel, The Witchwood Crown, Book One of “The Last King of Osten Ard”. There hasn’t yet been much analysis of this list in the blogosphere, so we at OstenArd.com are going to do some analysis. Also returning are the Sa’onserei siblings, Jiriki and Aditu. Several of the names that Williams released are returning characters. Among these are Jiriki and Aditu, son and daughter, respectively, of the House Sa’onserei, the ruling house of the immortal Sithi. Conspicuously absent, however, are the names of any of the other Sithi who dwelled in Jao e-Tinukai’i during “Memory, Sorrow and Thorn”: there is no mention on the list of Likimeya, the queen of the Zida’ya; her brother, Khendhraja’aro; or Kira’athu, the healer. These three characters played important (albeit secondary) roles in “Memory, Sorrow and Thorn”. Their absence indicates the possibility that the Sithi city of Jao e-Tinukai’i will not appear in “The Witchwood Crown” (other important Sithi characters included Amerasu, Shima’onari, Ann’ai and Kuroyi of Anvijanya, but these characters had passed on by the end of To Green Angel Tower). Hakatri, son of Amerasu and Iyu’unigato, may reappear in the new series. The only other “returning” Sithi character on the list is Hakatri i-Sa’onserei, son of Amerasu Ship-born and Iyu’unigato the Erl King, and brother to Ineluki the Storm King who played a major role in the destruction of the mortal world in “Memory, Sorrow and Thorn”. It is not certain that Hakatri will return in the new series, or if he is simply a character mentioned in passing. However, even the possibility of Hakatri’s return sets the stage for a possible major conflict between the humans and the Gardenborn once more. Hakatri’s doings were legendary even among the Sithi. But Hakatri was badly burned a thousand (or so) years earlier, and has apparently not set foot in Osten Ard for centuries. Attempts by the Sithi to reach Hakatri via the Master Witnesses have all failed, indicating that he was far away from Osten Ard, or possibly no longer even alive. With Jao e-Tinukai’i likely sidelined, the focus of the Gardenborn part of the story seems to be Nakkiga, the frozen city of the Norns, in the far north above Black Rimmersgard. In fact, Williams has stated that the immortal Norns will have an important role to play in the new series. Two of the names on the published character list are Utuk’ku the Norn Queen and Akhenabi, both of whom were antagonists in “Memory, Sorrow and Thorn”. Utuk’ku is expected to be a major antagonist in the new series, as one of the few major villains left at the end of the original series. The part that Akhenabi will play is as yet unknown; the embittered Norns were defeated and seemingly broken at the end of “Memory, Sorrow and Thorn”, leaving interesting possibilities in the new novels, set thirty years after the end of To Green Angel Tower. No other previously-seen Gardenborn names appeared on Williams’ new character list. Because the name of the third novel in the new series was announced as The Navigator’s Children, it seems likely that the Dwarrows and Niskies will have some part to play in “The Last King of Osten Ard”, but the names Yis-fidri, Yis-hadra, Sho-vennae, Imai-an and Nin Reisu, all Dwarrow or Niskie characters from “Memory, Sorrow and Thorn”, do not appear on the new character list. Many new names on the list, however, do appear to be Gardenborn names. Among these are Nezeru, Takeru, Tsoja/Tsoji, Saojemi, Viyeki, Rinan, Khibi-Ya, and possibly Kulva, Jhesa, Ommu, and Makho. The names Rinan and Khibi-Ya follow formats similar to Niskie and Dwarrow names, respectively. Names ending with a -u and -a are likely to be female Norns. Names ending in -i and -o are likely Norn males. Alternately, the character names ending in vowels may be new Sithi characters. Some, including Kulva, Jhesa, Ommu and Makho, may be non-Gardenborn names. Simon and Miriamele return in “The Witchwood Crown”. Among the returning mortal characters will be King Simon and Queen Miriamele, who have apparently ruled Osten Ard for the last thirty years. Count Eolair of Hernystir, Duke Isgrimnur of Rimmersgard, Jeremias, Binabik, Sisqinanamook, Tiamak, Prince Josua and Lady Vorzheva also appear on the character list, indicating that they will return in the new series as well. Hyara (Vorzheva’s sister) and Pasevalles (the young boy in Nabban) also appear on the list. Notably absent are Rachel, Father Strangyeard, Sludig, and Josua’s twin children Derra and Deornoth. However, the original press release has indicated that Derra and Deornoth will have a role to play in the new series. Also not mentioned are Count Streawe, Duke Varellan, Lector Velligis, Queen Inahwen, and March-thane Fikolmij, who were the rulers, respectively, of Perdruin, Nabban, Mother Church, Hernystir, and High Thrithing thirty years earlier. It remains to be seen who now rule these lands. The names John and Pryrates also appear on the new list. These two characters are likely only mentioned in passing, since they died thirty years earlier. One “new” name on this list, Morgan, was announced in the press release in April. Morgan is the prince of Erkynland, heir apparent to Osten Ard. He is likely either the son or grandson of Simon and Miriamele. It seems likely that he is their son, named in honor of Doctor Morgenes, Simon’s long-dead mentor. Little can be deduced from the remaining new names, save that Jarnulf is likely a Rimmersman; Qina and Ommu may be Qanuc; Little Snenneq is definitely Qanuc, and is probably the son of Snenneq, who appeared in “Memory, Sorrow and Thorn”; Olveris, Drusis, and Saluceris are likely Nabbanai; Tylleth and Etan may be Hernystiri; and Grimbrand and Osric are probably Erkynlanders. Fremur may be a Rimmerman god. The remaining names — Astrian, Drojan, Goh Gam Gar, Hugh, Idela, Lillia, Narvi, Porto, Udrig, and Unver — are hard to classify. It has been revealed that Narvi is a baron, but where he lives has not yet been revealed. Williams has stated that more may be revealed soon, sometime after he begins the second draft of The Witchwood Crown. At some point, he will conduct chapter readings for fans. The book is tentatively slated for a Spring 2016 release. It’s been said that there are certain books you have to read at the right time in your life in order to understand them completely, novels that speak to particular age groups or circumstances. The Catcher in the Rye and A Separate Peace come to mind, for example; maybe The Sun Also Rises. All great works of fiction at any age, but particularly powerful when read as an adolescent (the Salinger and Knowles novels) and as a young man (the Hemingway). This seems axiomatic to me, and no work of fiction proves it more strongly than The Dragonbone Chair. SF-Signal’s Larry Ketchersid recently wrote an article entitled “The Dragonbone Chair by Tad Williams and Its Place in the History of Epic Fantasy,” a timely retrospective on the 1988 fantasy classic written in anticipation of the forthcoming sequel series, The Last King of Osten Ard. Reading it made me want to talk about what The Dragonbone Chair and its sequels mean to me, as their impact on my life has been significant. Spoilers abound. Cover of Dead Man’s Hand anthology of weird tales. 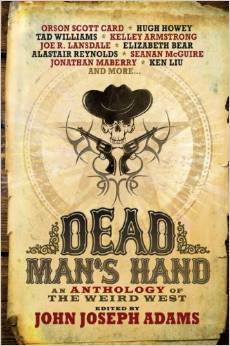 Edited by John Joseph Adams, Dead Man’s Hand: An Anthology of the Weird West has just been published by Titan Books. The anthology includes short stories written by Orson Scott Card, Hugh Howey, Kelley Armstrong, Joe R. Lansdale, Elizabeth Bear, Alastair Reynolds, Seanan McGuire, Jonathan Maberry, Ken Liu, Ben H. Winters, David Farland, Mike Resnick, Charles Yu, Alan Dean Foster, Beth Revis, Rajan Khanna, Tobias S. Buckell, Jeffrey Ford, Laura Anne Gilman, Walter Jon Williams, Fred Van Lente, Christie Yant, and Tad Williams. In all, the collection includes 23 stories. Tad Williams’ story, “Strong Medicine”, fits in nicely with this collection of weird tales from the Old West. Taking place on June 20th and 21st, 1899, the short story recounts the bizarre events that took place in Medicine Dance, Arizona, when dinosaurs and other prehistoric creatures are suddenly spotted in the community. A winged monster, resembling a huge alligator with an extremely elongated tail and an immense pair of wings, was found on the desert between the Whetstone and Huachuca mountains last Sunday by two ranchers who were returning home from the Huachucas. The creature was evidently greatly exhausted by a long flight and when discovered was able to fly but a short distance at a time. After the first shock of wild amazement had passed the two men, who were on horseback and armed with Winchester rifles, regained sufficient courage to pursue the monster and after an exciting chase of several miles succeeded in getting near enough to open fire with their rifles and wounding it. The creature then turned on the men, but owing to its exhausted condition they were able to keep out of its way and after a few well directed shots the monster partly rolled over and remained motionless. The men cautiously approached, their horses snorting with terror, and found that the creature was dead. They then proceeded to make an examination and found that it measured about ninety-two feet in length and the greatest diameter was about fifty inches. The monster had only two feet, these being situated a short distance in front of where the wings were joined to the body. The head, as near as they could judge, was about eight feet long, the jaws being thickly set with strong, sharp teeth. Its eyes were as large as a dinner plate and protruded about halfway from the head. They had some difficulty in measuring the wings as they were partly folded under the body, but finally got one straightened out sufficiently to get a measurement of seventy-eight feet, making the total length from tip to tip about 160 feet. The wings were composed of a thick and nearly transparent membrane and were devoid of feathers or hair, as was the entire body. The skin of the body was comparatively smooth and easily penetrated by a bullet. The men cut off a small portion of the tip of one wing and took it home with them. Late last night one of them arrived in this city for supplies and to make the necessary preparations to skin the creature, when the hide will be sent east for examination by the eminent scientists of the day. The finder returned early this morning accompanied by several prominent men who will endeavor to bring the strange creature to this city before it is mutilated. We left the rest of the citizens arguing about why exactly the Devil had brought the sea to Medicine Dance and made our way back along the shore on the edge of town, reptile-birds wheeling and croaking high above us. We paused for a moment to watch a bunch of boys — Clay Hopyard’s sons, Billinger told me — who had made themselves a raft out of stripped saplings and were wading out into the water. The young sailors were being watched by a half a dozen men taking some rest, who said they’d been chasing the springy little lizards out of nearby houses for the last hour, but I was concerned. I shouted to the boys to come in, but we were still too far away for them to hear. As they listened to me, the men watching seemed to realize that this new ocean might contain things bigger than the fish they were used to pulling from the local streams, but before they could do more than look thoughtful, a long neck suddenly came coiling up out of the water near the children, silver in color and as long as a horseshoe pitch. The boys screamed when they saw it, and all of them ran to one end of their raft, which promptly capsized. This is a satisfying tale with some similarities to Arthur Conan Doyle’s The Lost World (1912), which only receives two minor demerits from me. One demerit for setting the story so close to monsoon without mention of the heavy seasonal rains, which would have been on the minds of the settlers in 1890s southern Arizona. And one nit-picking demerit for having a prehistoric animal eat grass, which did not exist until near the end of the Cretaceous Period.